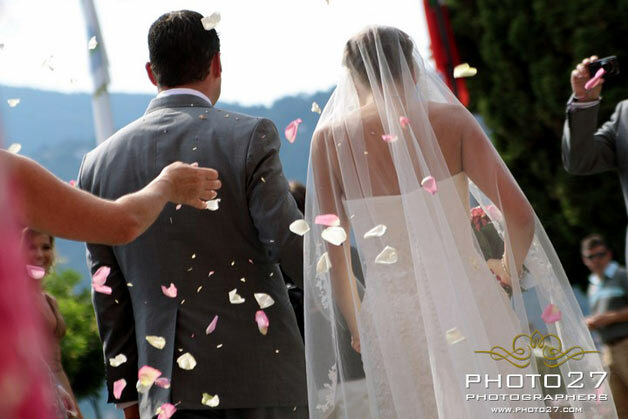 Home » Lake Orta Weddings » Lake Orta is waiting for you! 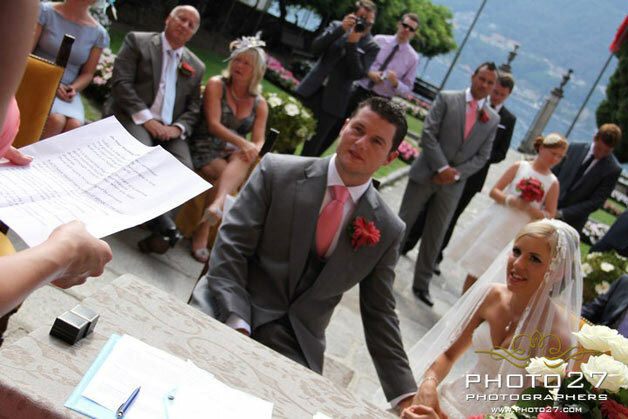 Browsing pages of our blog you can see how many couples come from different countries to get married on our lakes. Lots of brides and grooms! Most of them are coming from Uk and Ireland. Some others come from USA, Australia and closer countries as Germany, Switzerland and France. Our lakes offer wonderful landscapes, history, romantic villages on the shores, ancient mansions and a great eno-gastronomic tradition made of great dishes and wonderful wines. 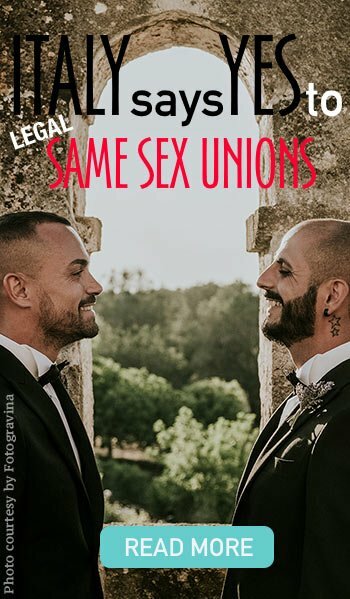 Many couples coming from abroad decide to celebrate their big day in a special destination and let their families and friends discover and appreciate wonderful areas! 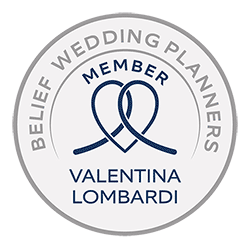 In some cases our couples decide to reduce a little their budget getting married in Italy. As a matter of fact some services could cost less in Italy than UK or Ireland. Lakes District could be a wonderful destination! To stay on the budget you have you need analyze each option, looking for the best solution and maybe find some help from local planners that have a a wide experience on the territory. 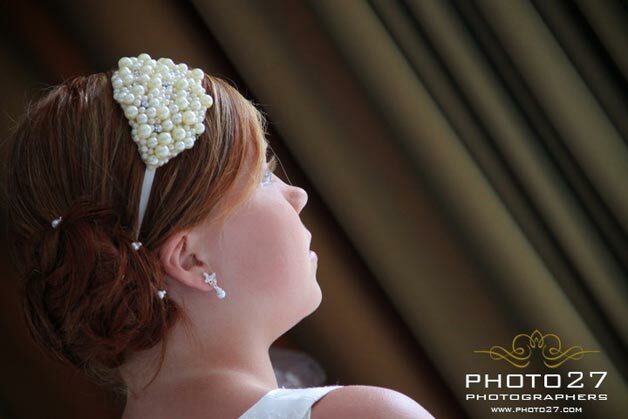 Today we show you a wonderful example that could explain better what we mean: sweet Holly and James’ wedding. Holly and James come both from UK. 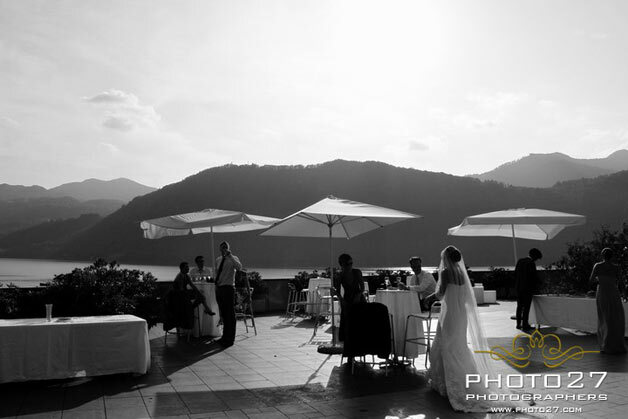 Some months before the wedding they contacted us to plan their wedding on Lake Orta. Holly wanted a simple and informal event. It needed to be sweet and unforgettable without grandness and without spending a fortune. On Lake Orta this is surely possible! 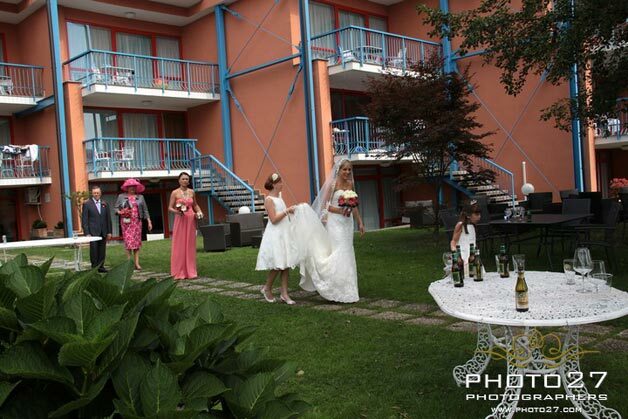 After seeing many options Holly and James chose Hotel L’Approdo in Pettenasco. It hosted 60 guests coming from UK. Hotel L’Approdo is a lovely and not expensive hotel. It has been recently renewed with wonderful rooms facing the lake. 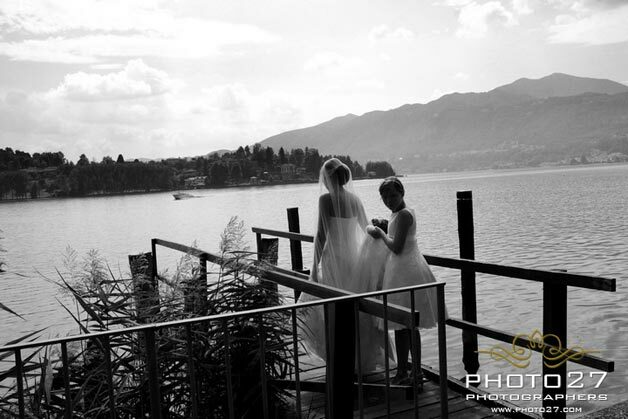 Bride and bridesmaids got ready here and after that they got on the boat to reach Villa Bossi for a wonderful civil ceremony. The entire event was follwed by Photo27 – Milano. 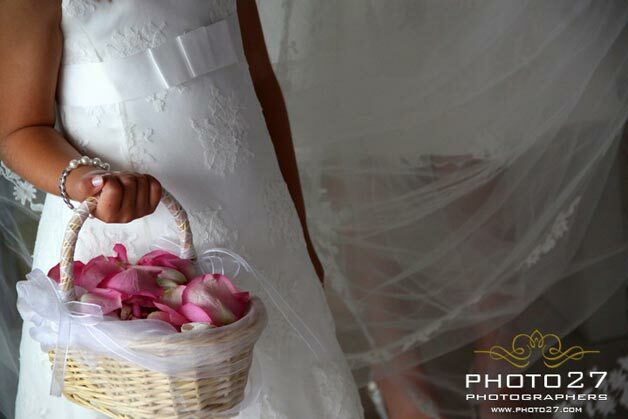 We are sure you know their wonderful shots of many other weddings we posted on our pages. Wonderful candid style. 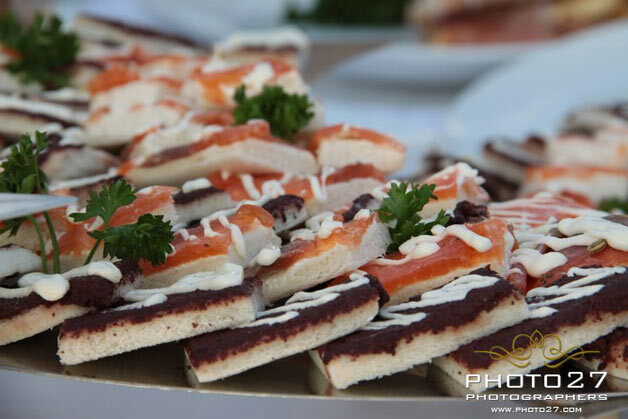 They are great telling the story of the event in a fresh and natural way. 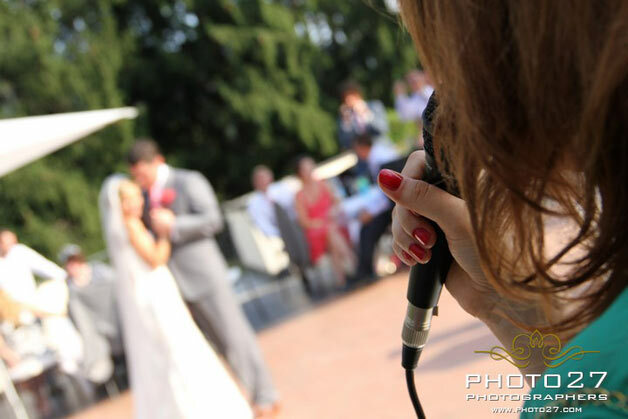 Holly and James loved Photo27 style, they booked them one year before the wedding! 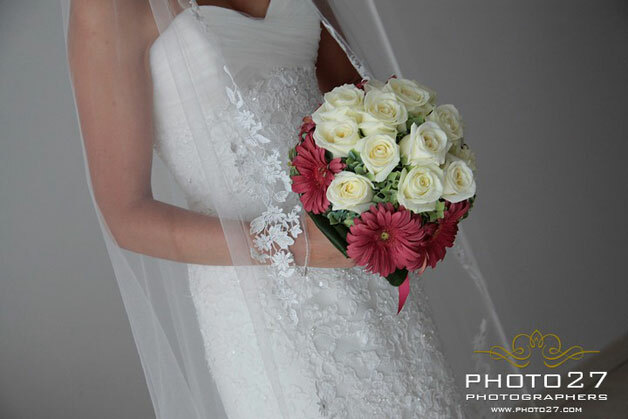 For her flowers Holly wanted a simple but pretty style staying in the budget she had. Gerberas were perfect. 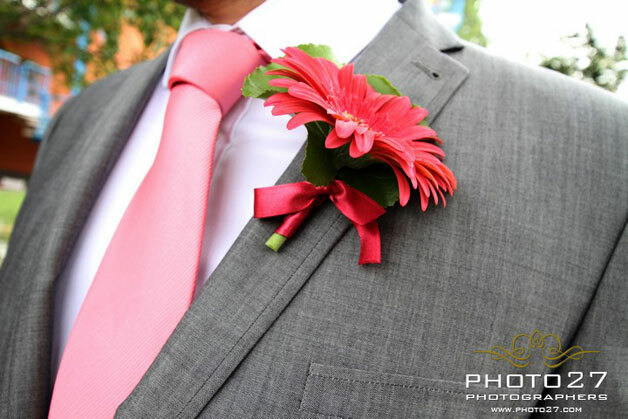 They are similar to Daisies and they have a special impact but affordable prices. As Holly wanted, Monika – La Piccola Selva floral designer – created a wonderful arrangement based on ivory and red colors. 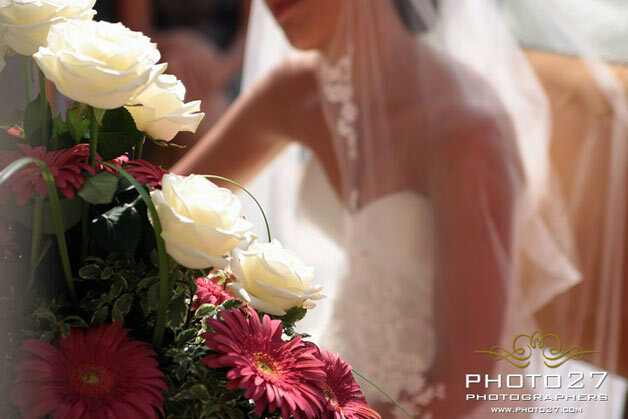 Bridal and bridesmaids bouquets and floral arrangements at Villa Bossi followed this theme. 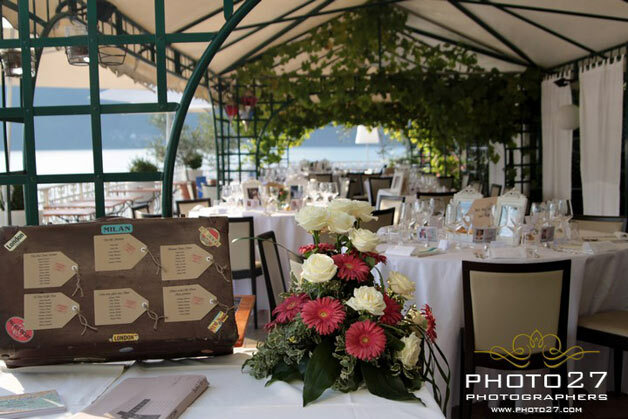 After the civil ceremony in lovely gardens ot Villa Bossi lit by a wonderful sunset, bride and groom got on a motorboat for an unforgettable photo tour on the lake and St. Julius Island. 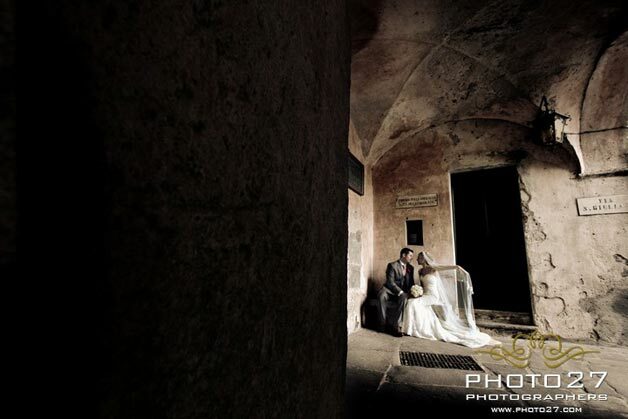 Bride and groom and the whole group reached then Hotel Giardinetto a lovely Hotel of the same chain of Hotel L’Approdo owned by Primatesta family. 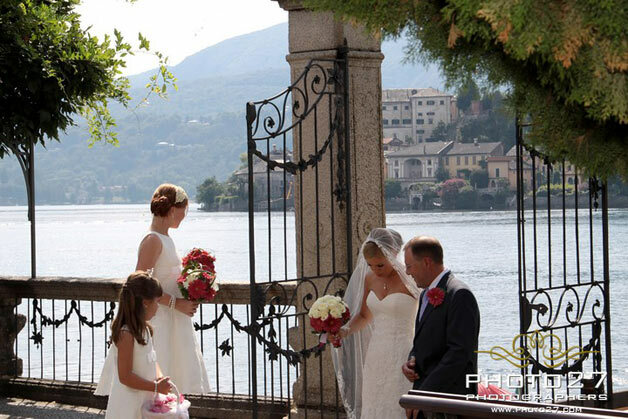 Primatesta family have managed some of the best hotels on Lake Orta for more than ten years, providing wonderful service and competitive costs. 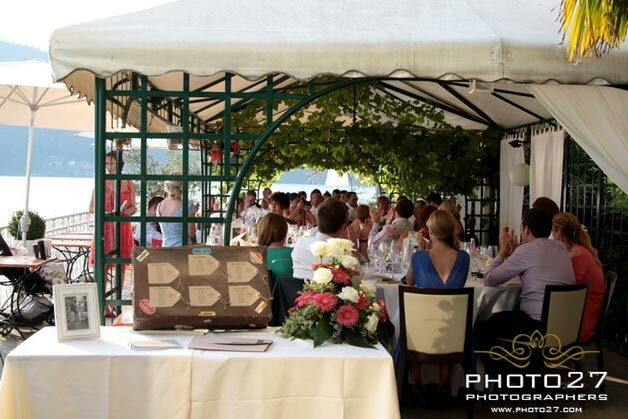 Aperitif at Hotel Giardinetto is usually served on the roof terrace and same was in occasion of Holly and James’ wedding. 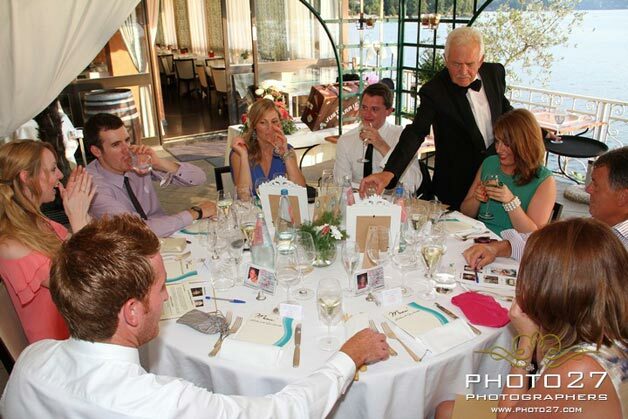 Live music, Prosecco and a rich aperitif accompanied the event. 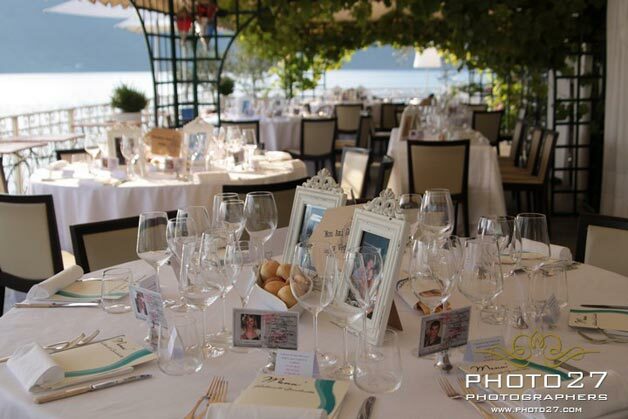 Dinner to follow has been planned on the terrace on the lake under the elegant gazebo of Ristorante Giardinetto. The the roof top again for the cutting of the cake, open bar and dances up to midnight! Have a look to original table chart Holly created with an old bag. What about the names cards? 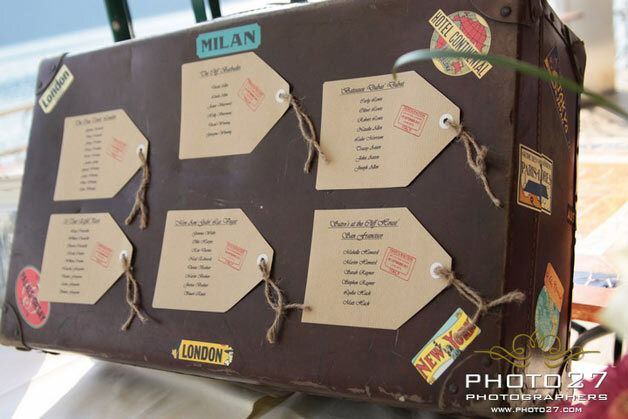 Pictures of each guest made like a vintage passport. If you are planning an informal and simple event without spending a fortune why don’t you take inspiration from Holly and James’ wedding?